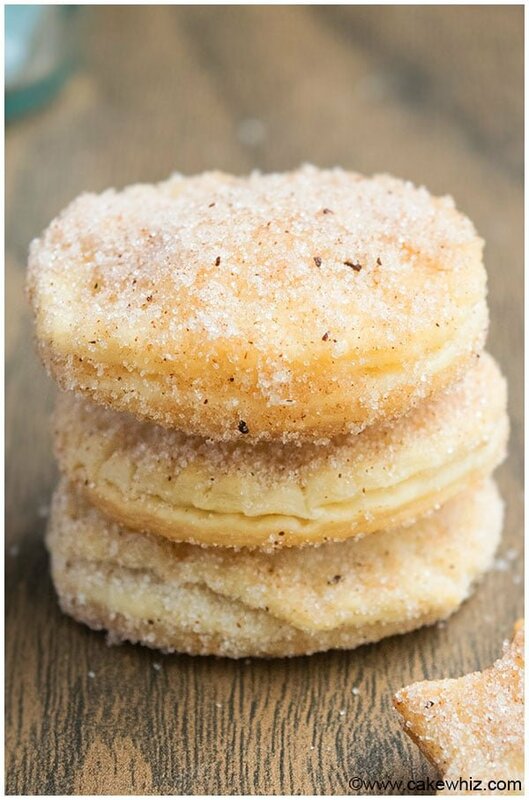 Quick and easy churro cookies recipe, made with 4 ingredients: pie crust, sugar, cinnamon and butter. These crunchy, crispy cookies are ready in 30 minutes! Many of you know that I grew up baking with my Mom and we used to LOVE making these “lazy”churro cookies. They were perfect for days when we wanted something sweet super FAST. We also started adding them into our Christmas gift boxes for family and friends. They quickly became very POPULAR in our group with everyone requesting the recipe. I make these with my own son now and it’s so EASY since there isn’t a lot of measuring or mixing required. It’s also a lot of FUN since my kiddo can use the big box of cookie cutters to make whatever shapes he likes and get as creative as he wants. These PRECIOUS memories in the kitchen with my little one mean the world to ME! While making these cookies, I thought about the Pillsbury Bake-off® Contest. If you enjoy baking, this contest is the perfect place to share YOUR heartfelt family memories, stories and recipes that mean the world to YOU! There are some fantastic prizes too. So, open your family recipe books, get creative and get baking! Can you imagine if your family recipe won?! Wow weeeee! Now, these are NOT authentic Mexican churro cookies. 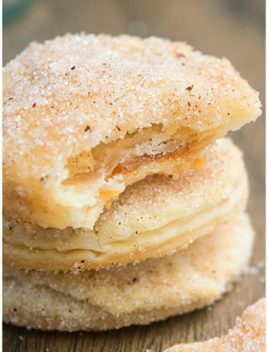 They are actually pie crust churro cookies and some people may even consider them to be one of those churro inspired desserts. Regardless, they are unbelievably delicious and addictive. They are CRUNCHY, CRISPY and loaded with cinnamon. They are also easy to pack, easy to ship and great as a homemade gift during the Christmas season. How to make churro cookies? The process is very SIMPLE. Start off by cutting round pie crust pieces. Place a small piece of caramel in the center. Brush edges with water. Cover with another piece of round pie crust. Press the edges with a fork and bake until golden brown. You can also omit the filling and just bake individual pie crust pieces. 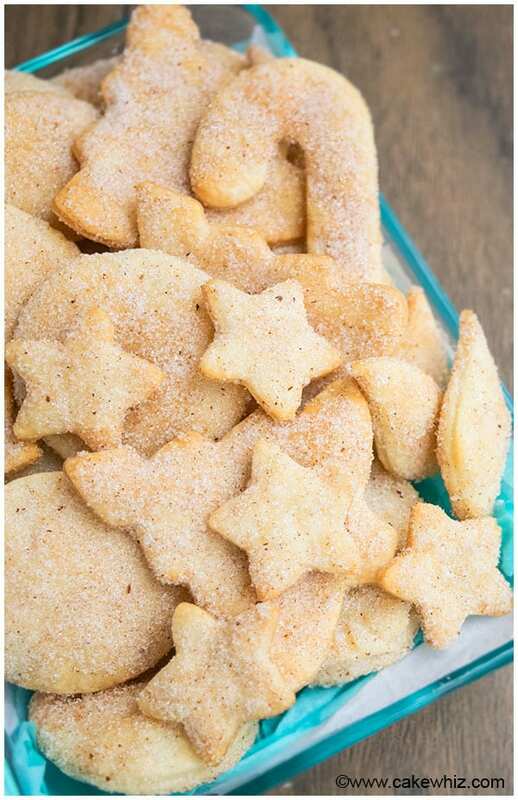 After the cookies cool down, brush the top and bottom with melted butter and coat them completely in cinnamon sugar. Enjoy! 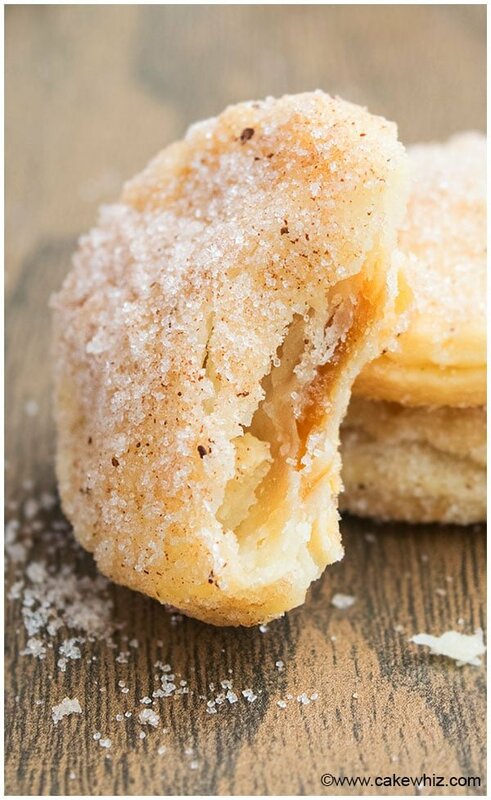 To make churro apple pie cookies, replace caramel candy with store bought or homemade apple pie filling but remember to use very little to prevent it from oozing out of the cookies. To make churro cookie bars, cut strips instead of circles and bake those. Then, cover them in butter and cinnamon sugar. To make churro cookies with chocolate, replace caramel candy with chocolate. Again, remember to use a small piece to prevent it from oozing out of the cookies. 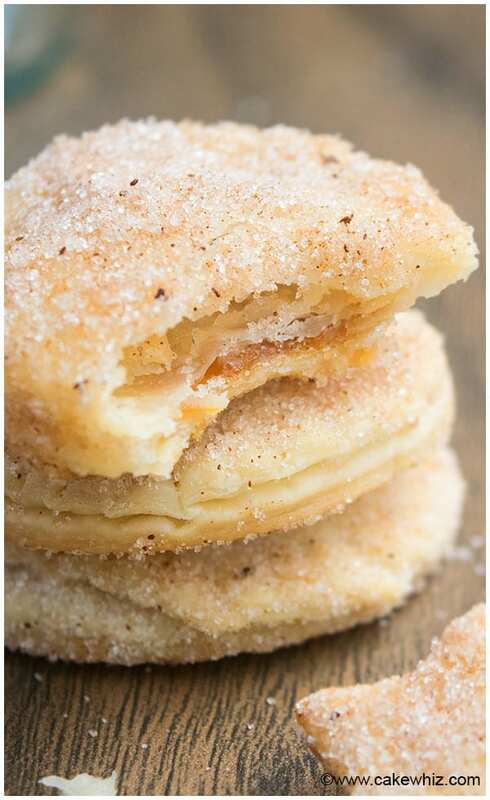 To make churro cookies with caramel cream cheese, spread a little cream cheese on one pie crust and place a small piece of soft caramel on top. Then, cover it with another pie crust piece and seal the edges with a fork. Bake and cover with butter and cinnamon sugar. Enjoy! Use UNSALTED butter because the salted one will make these cookies very salty. DON’T replace granulated sugar with powdered sugar because you will loose out on the sugary crunch. DON’T over-fill the cookies or else the filling will leak out and make a mess. You can make these cookies with filling or without filling. If you are making without filling, just place the cut out pieces on a cookie tray and bake until crispy and golden brown. Then, brush them with butter and cover them in cinnamon sugar. I used Pillsbury pie crust, which is very simple to use and delicious as well. 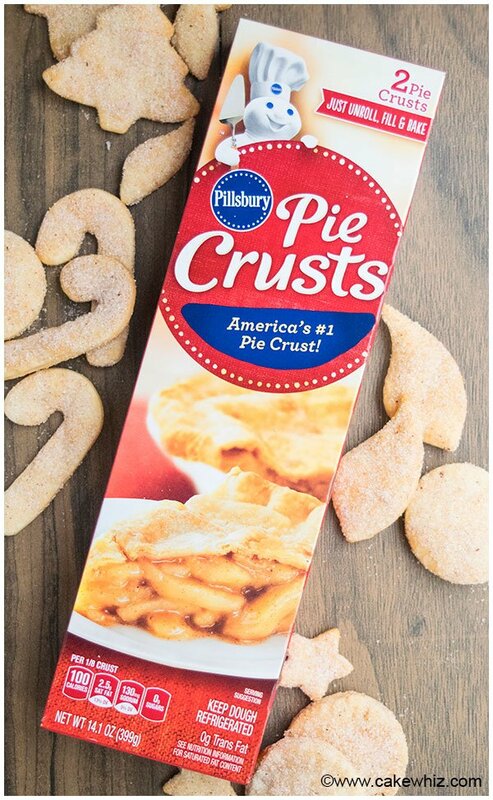 Each box comes with 2 pie crusts. You just roll them out and use them any way you like. Also, be sure to enter the 48th Pillsbury Bake-off® Contest and share your family’s favorite holiday creations for a chance to win some fabulous prizes! The grand prize winner will receive a kitchen makeover from GE Appliances, $50,000 in cash, and appear on an episode of The Kitchen, as well as in Food Network Magazine. To learn more about The Pillsbury Bake-off® Contest, click HERE. Roll out the pie crusts and use a small round cutter to cut out 12 pieces on each crust. You can reuse the crust and roll it out again to make more circular pieces. Place a small piece of caramel candy in the center of one piece. Place another pie piece of top of the caramel and press the edges with a fork to seal everything together. Place cookies on a tray, lined with parchment paper. Bake at 400 degrees for about 8-10 minutes OR until golden brown along the edges. Allow the cookies to cool down. Meanwhile, prepare the sugar mixture by mixing together the granulated sugar and cinnamon in a small mixing bowl. When the cookies cool down completely, brush melted butter on both sides. Roll them in a bowl of cinnamon sugar. Enjoy! Real all my tips above. Can you give details on the size of the circles and how big is a “small piece of caramel”? These look delicious. My cutter was 2 inches in diameter. For small pieces of caramel, you can just cut the store bought soft caramel candy in half and use half in each cookie. Hope this helps. Happy baking!